First I want to thank Post for sponsoring this post. The countdown to Christmas has officially begun. In our home this means watching the Christmas movies and listening to the Christmas music that we look forward to hearing every year. I love this time of year because it just seems like everyone is more cheerful. I also tend to get in the kitchen a little more and try new recipes. I am not a baker by any means but every once in a while I like to give new things a try. 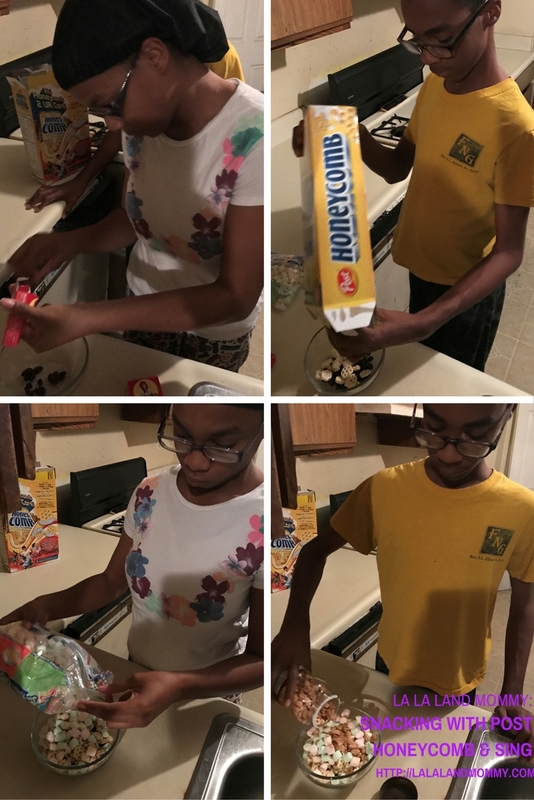 I recently tried a new trail mix recipe using Post Honeycomb cereal. I love to snack and I love to make snacks with my family. I like to do anything that will bring my family together. If cooking is one of those things that do it then lets go. This quick snack took me less than 15 minutes to make. It requires no cooking. I started off by heading to my local Kroger to pick up everything that I need. I picked up raisins, peanuts, marshmallows, and of course some Post Honeycomb cereal. Making this trail mix brought back memories of me as a kid eating plain cereal for a snack right out of the box. It used to be a great snack. I still do it on occasion with some of my favorite cereal. Tyler and Nishe’ came in the kitchen with me to help me mix this up. They each put in some ingredients. We then mixed everything all together and then gave it a taste. It was so delicious! I wish I had thought of it before. I would totally make this again. Everything was the perfect combination of sweet and salty. Another thing I like to do with my family is catch a great movie at the theater. Just so happens a movie that looks like it is perfect for the family will be hitting theaters Dec. 1st. The movie is called SING. SING is a movie about Buster Moon the koala bear’s attempt to return his theater to its glory days of being a success. His idea to do this is to have a singing competition. I love cartoons, comedies, and musicals. This movie appears to give me all of this in one movie. That’s why I plan on going to see it with my family. We can all use a great laugh. This movie seems sure to give us some great entertainment. Unfortunately for now we are counting down the days until December 21st comes. But there are a few things that we and you can do until then. You can head over to Coupons.com and get a great deal on your favorite Post cereal. After you purchase your cereal you can enter the Sing sweepstakes where you have the chance of winning $100,00 and other great prizes. Also don’t hesitate to have fun by making your own fun recipes with your favorite Post cereal. What traditions do you have with your family? Are you ready to go see SING? That looks so good! I've been buying Honey Comb for years. I've never thought of doing anything like that with it, though. That looks so good. My family's favorite thing to do is watch movies and stuff our faces with snacks like this. I see a new movie night fave. I hope you enjoy it if you give it a try. No movie night is complete without great snacks. My kids always loved Honeycomb cereal. It is perfect for breakfast or for snacking! 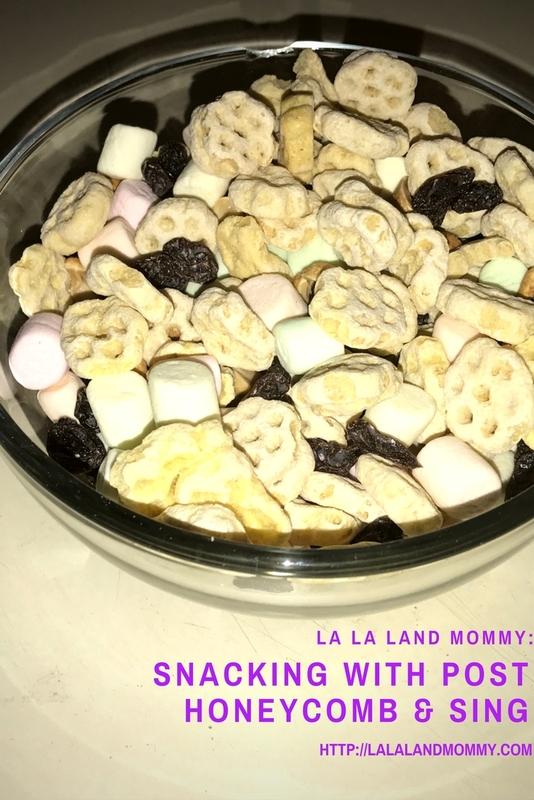 We love a good snack mix, especially while watching a movie. This combo looks yummy! We love Post Honey Comb! It's such a great way to start the day. My family is also really excited to see the new movie SING this winter too! I would love to prepare this snacks for my kids. They will enjoy eating this. Thanks for the tips. 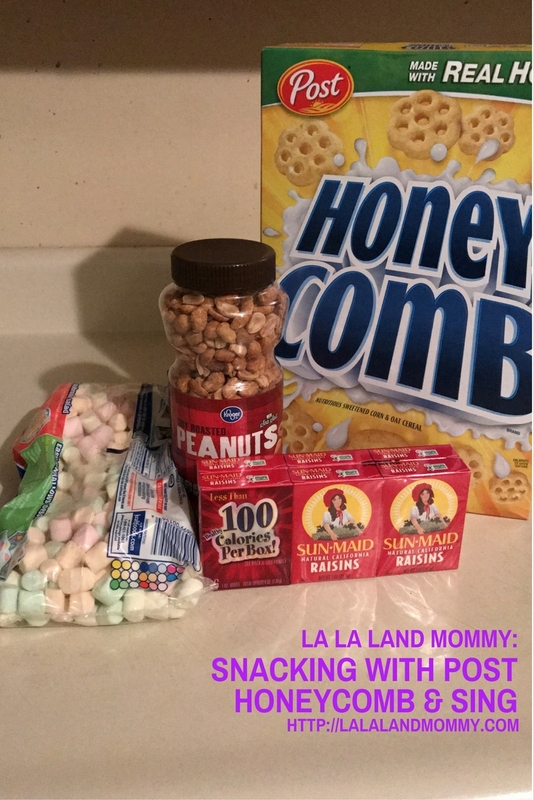 That would be a great healthy snack to enjoy for movie marathon nights with the fam. It would be a great alternative to our usual chips and dip or caramel popcorn. Thanks for the idea! This looks like a great snack my kids will love. Love how you can mix that Honey Comb to other healthy snacks. This sounds like such a great treat. My family would probably eat is as a bowl of cereal with milk though. Sing looks like such a fun movie. My kids would love to make this as a snack. I agree it does look like a great movie. I am hoping to catch it in theaters too. It's been so long since I've had honeycombs! They used to be a favorite of mine! It was a favorite of mine as well. I used to be so happy when my mom got it as a kid. Yum what a fun and delicious snack! 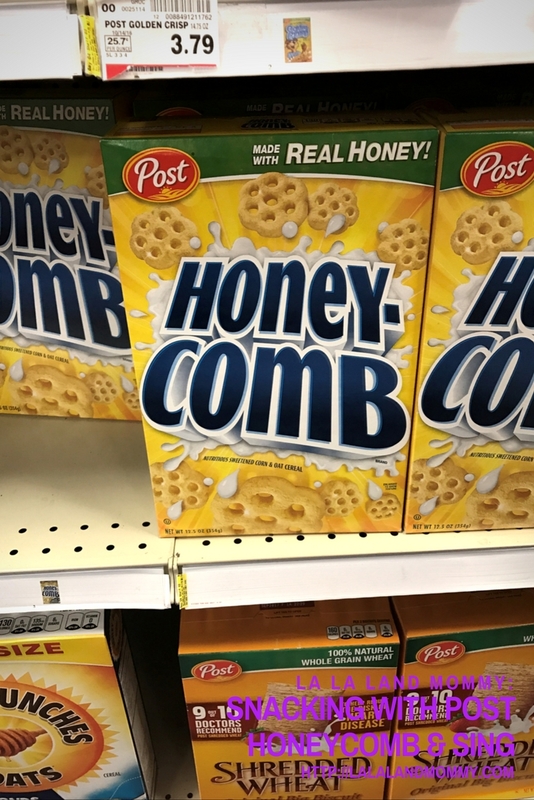 We love post and always have honey combs on hand. I will have to try something like this, I bet its just yummy! I was remembered Honeycomb cereal growing up. It is nice to know it is made with real honey. It has been a while since we have had Honey Combs cereal here. Maybe I will buy it for my kids this week. I loved Honeycomb when I was a kid. This looks like a fun snack mix. I can't wait to see Sing or try this yummy snack. It looks perfect to me because I love the flavor combo. Looks like a fun and easy snack to make, I'd probably try craisins instead of raisins. Yes making it was so much fun. Yeah I used eat a lot as a kid too. 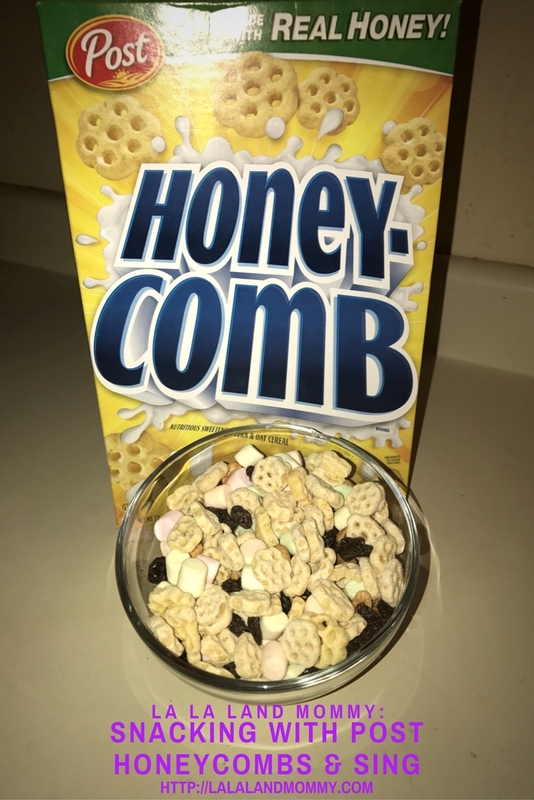 I love Honey Comb cereal, never thought of using it as trail mix. I like dry cereal and with milk. 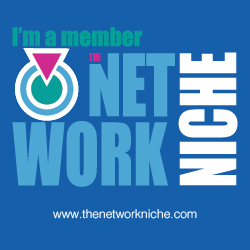 I don't have children but i like activities that you can do with the children. Haven't heard about the movie Sing before? Yes this was my first time turning it into trail mix. It made for a really great snack.